The following case study illustrates how the Digit Widget can be used to reverse a flexion deformity caused by a sports injury. 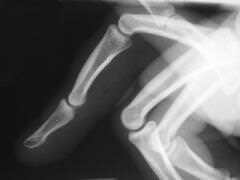 A 35 year-old man injured his right ring finger during a martial arts training session. Nine months later, he was referred for treatment of a persistent finger deformity that was painful and limited hand function. Previous attempts at serial plaster casting and dynamic splints failed to improve the finger’s ROM. 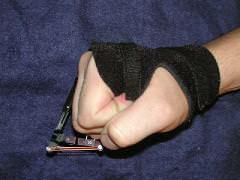 A Digit Widget was used to treat the deformity. 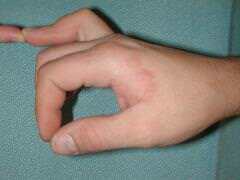 When applied, the patient had a 70 degree flexion contracture of the PIP joint with active flexion to 100 degrees. DIP motion was 0-35 degrees. 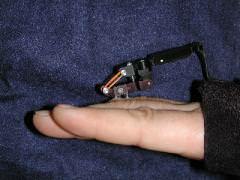 Patient with Digit Widget applied to finger. After four weeks, the Digit Widget was removed. 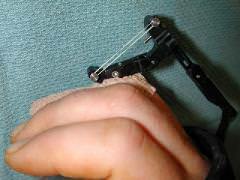 Upon removal, the finger lacked 8º of extension and had maintained 100º of active flexion.